Springfield Properties saw its shares rise to their highest value since September after half-year profits more than doubled at the housebuilder. Elgin-based Springfield said yesterday its private and affordable housing divisions were supported by “strong market drivers”. And chief executive Innes Smith brushed off suggestions that markets could suffer a jolt after Brexit, insisting there is no sign of demand for new homes falling away and also that the “nonsense” over the UK’s withdrawal from the EU will inevitably be sorted “at some point”. He was speaking after Springfield posted a near-120% year-on-year jump in pre-tax profits, to £6.1 million, for the six months to November 30. Revenue surged by 38% to £75.7m as the company ramped up home completions by 35.4% to 379. Springfield expanded an 18-year land bank to 15,096 plots, 31.9% of which have planning permission. 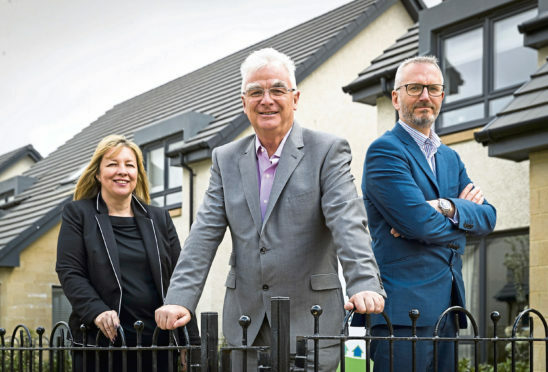 Dawn Homes – the Glasgow housebuilder acquired by Springfield last year in a deal worth up to £20.1m – “performed strongly”, while recent acquisition Walker Group – snapped up for £72.4m a few weeks ago in another central belt expansion – is also expected to fuel future growth. Investors in AIM-listed Springfield responded positively to the figures, sending shares up nearly 3%. Mr Smith said demand for housing in Scotland was outstripping supply, adding: “Mortgages are still readily available and interest rates low. On Brexit, he said: “Scotland has had uncertainties for the past 10 years. Chief financial officer Michelle Motion said continued investment in expansion was driving profits growth, with income from Dawn Homes and a prior year on-off cost linked to the company’s 2017 flotation both boosting the 2018-19 half-year result. Net debt at November 30 totalled £25.3m, up from £15.3m at the end of May, which Springfield said was primarily due to an expansion in working capital to support business growth.